In 1990 Ugo De Rosa embarked on a new project to build a bicycle from titanium tubes which would stand up to rigors of professional racing and have the ride quality of a DeRosa. Ugo spent over three years in the reserach and development phase of his newly project. In 1993, the DeRosa Titanio was born and delivered only to the strongest guys of Gewiss-Ballan Team (most of the guys still rode DeRosa Primato made of Columbus EL). The results were fantastic, the riders were flying on their titanium racing machines. 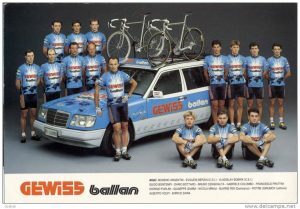 The Gewiss-Ballan team collected over 40 victories in 1994, some of their biggest were: Milan-San Remo (G.Furlan), Liege-Bastogne-Liege (E.Berzin), Fleche Vallone (Argentin, Furlan, Berzin), Giro d’Italia (Berzin beating M.Indurain), Tour of Lombary (V.Bobrik). 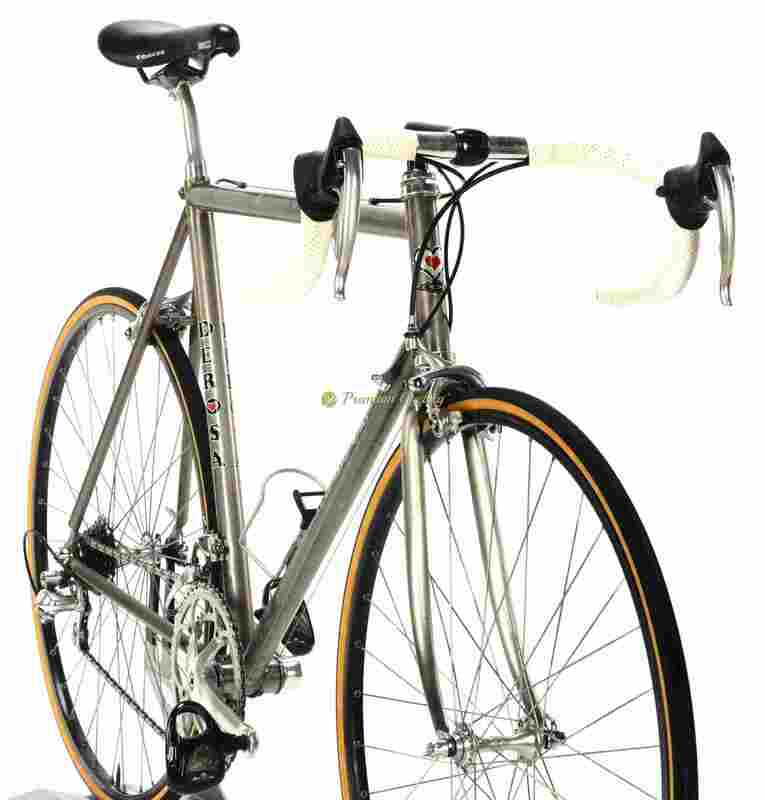 Proudly presenting another outstanding racing machine from Cusano Milanino – DE ROSA Titanio 1993. It’s the first generation Titanio model by master Ugo De Rosa and was the reference by which other titanium frames were judged. It’s made of superlight titanium tubeset, equipped with Campagnolo C Record 8s groupset, Ambrosio Durex wheels, Concor light saddle, 3ttt cockpit. A bike with a soul that brings back mid 1990s memories and still rides like a rocket. The icon. Nice catch for any DeRosa collector. Condition: Used, but good condition. The frame has no cracks, no dents, not bent. Some laquer chips and some some signs of normal use. Groupset and other components are in good condition.